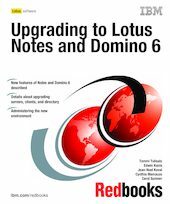 In this IBM Redbooks publication, we show how to upgrade existing Lotus Notes and Domino installations to IBM Lotus Notes and Domino version 6. The chapters have been structured as a series of logical steps that you can follow when upgrading your environment. First, we introduce the new features of Lotus Notes and Domino 6, and discuss overall upgrading considerations, coexistence issues, and interoperability. Next, we examine upgrading considerations specifically related to clients and servers. Then we guide readers through the actual steps needed to upgrade the Domino Directory, the Domino Server, and Lotus Notes Clients. monitoring, messaging, security, administering clients, policy-based administration, and more. Information on troubleshooting is also provided. of Domino infrastructures and Domino servers is assumed.